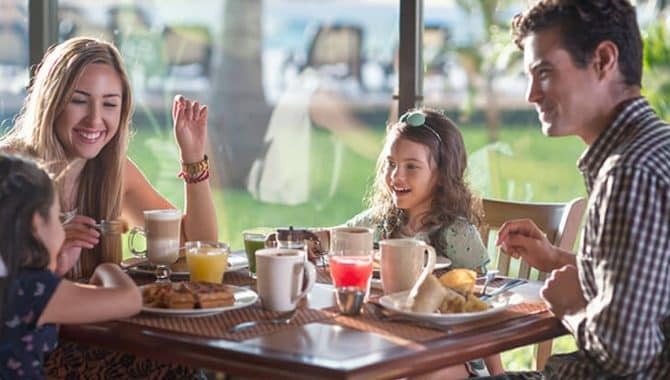 Planning the perfect family vacation takes a lot of thought, especially when everyone in your party has different interests. 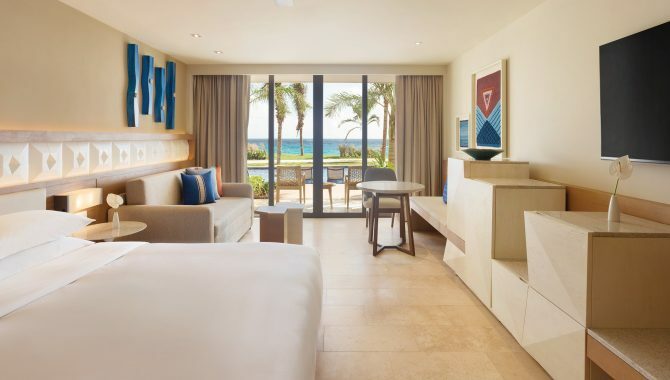 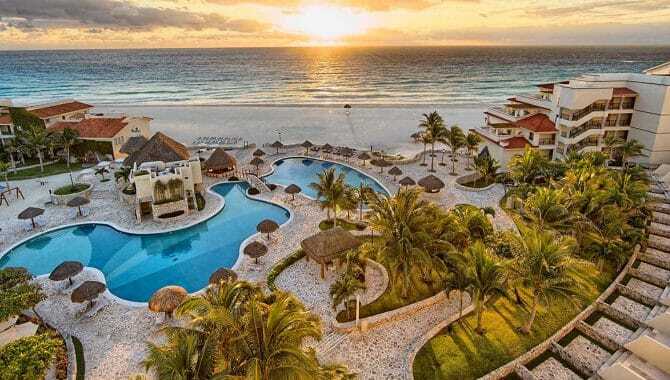 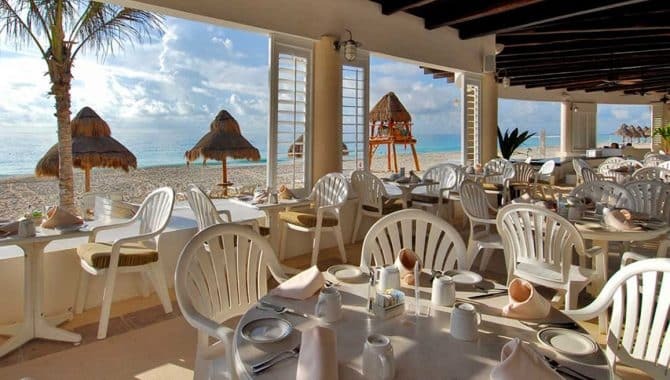 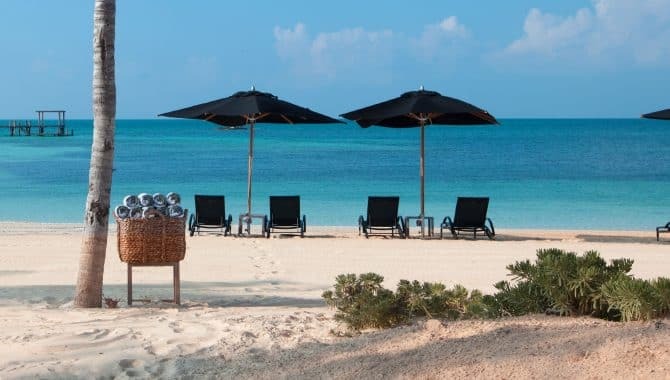 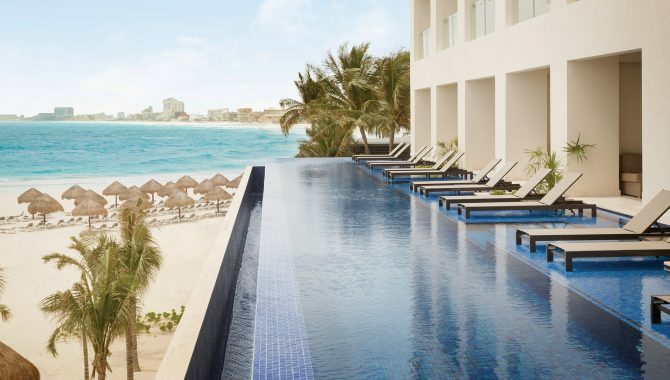 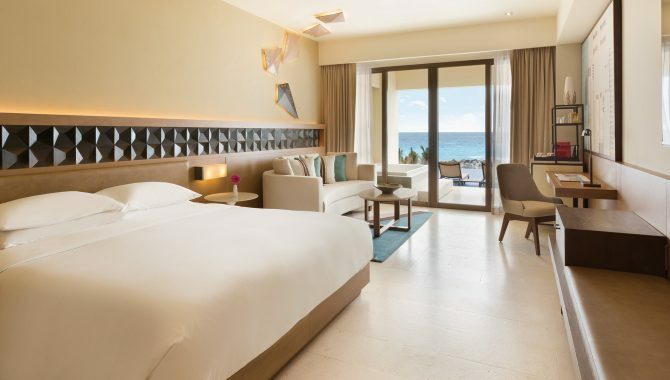 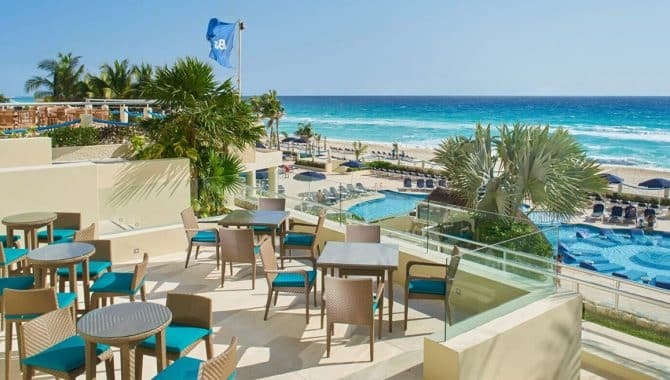 These beach hotels and resorts in Cancún are all designed with amenities galore, dining options for the pickiest of eaters, and kids’ clubs and designated kid-friendly areas so everyone from toddlers to teens can create their dream getaway. 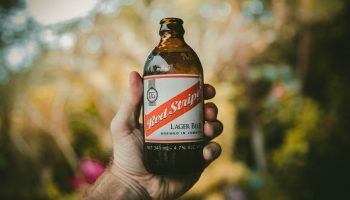 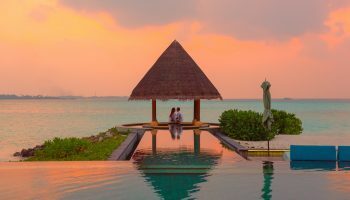 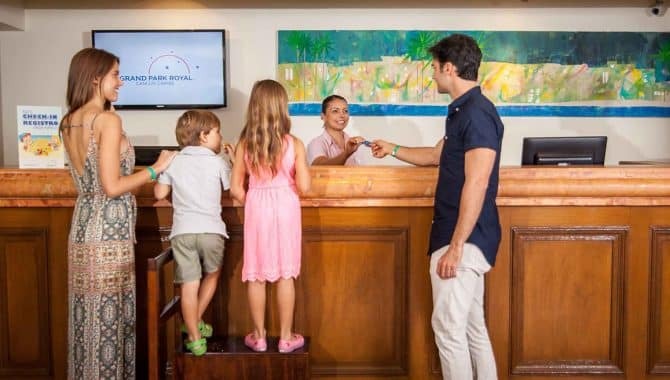 Choose from all-inclusive resorts that will leave you entirely worry free, or opt for a boutique-style hotel with childcare so the grown ups can enjoy some alone time too. 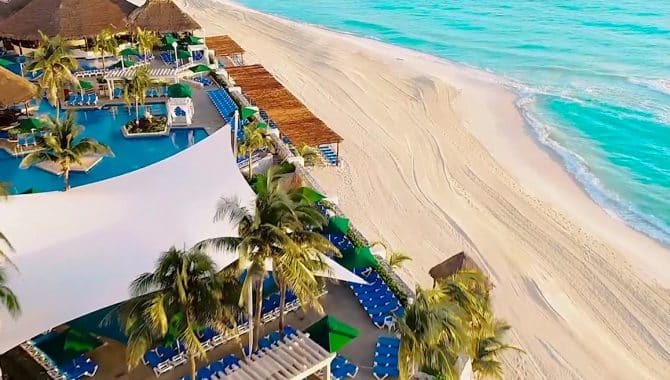 Cancún’s long list of beach hotels and resorts means no one in your travel party should have to substitute their version of fun! 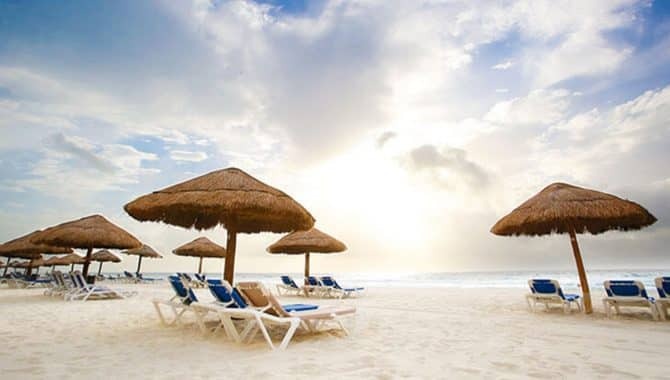 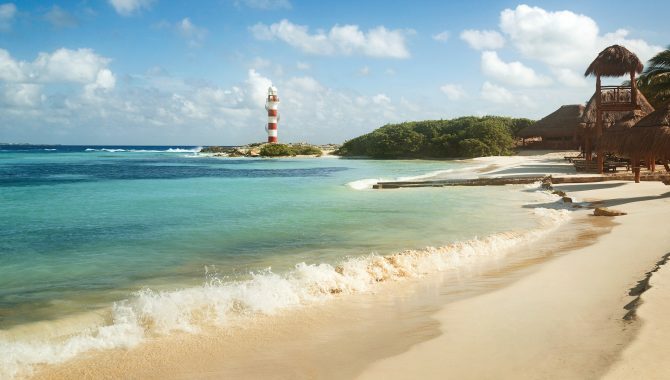 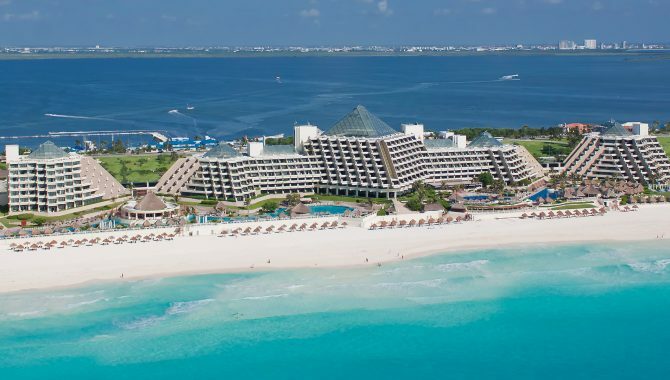 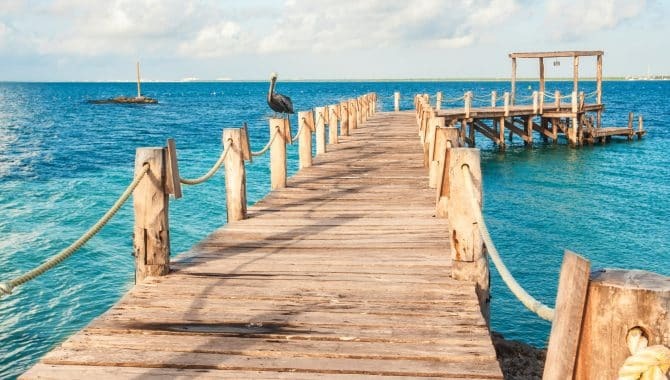 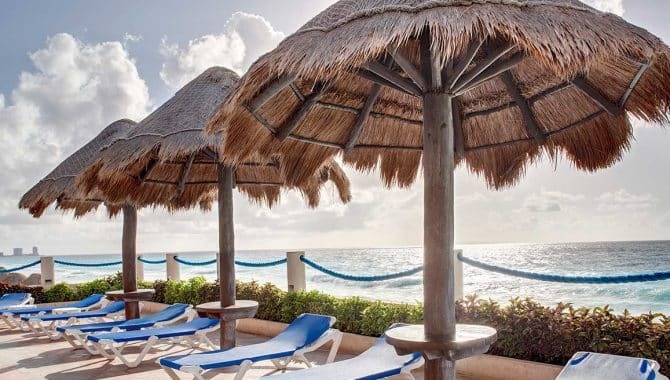 Make memories the whole family will treasure at these top family-friendly beach resorts in Cancún. 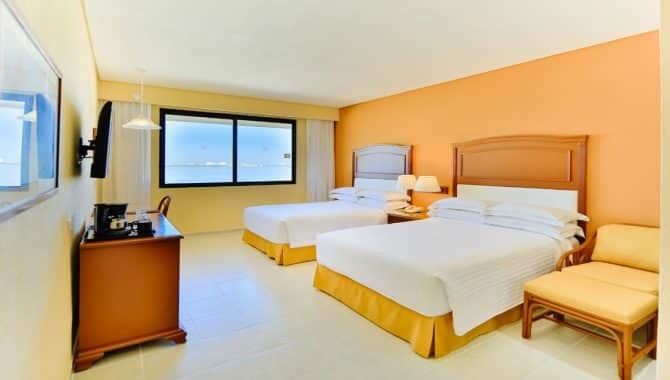 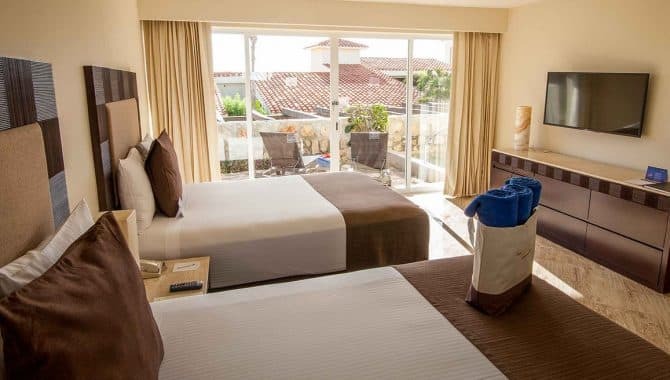 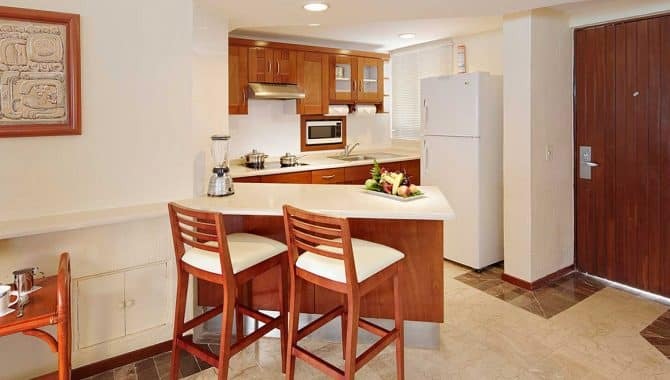 Traveling families will find a home away from home at Panama Jack Resorts Cancún. 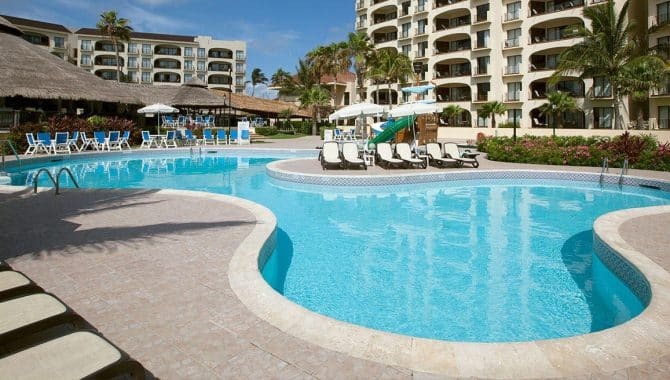 All around you’ll see parents lazing by the pool, cocktail in hand and children frolicking through the kids’ pool and water slides. 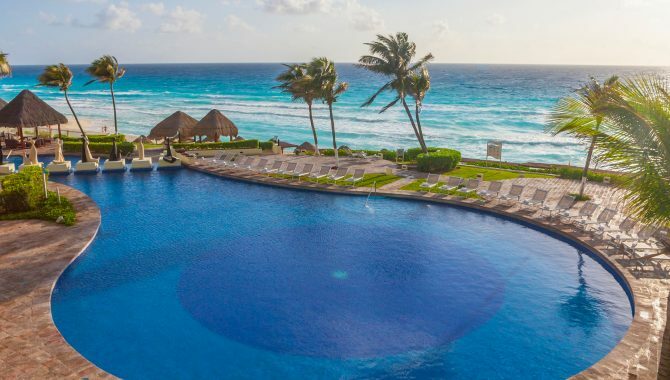 You won’t lift a finger by the pool or in your rooms—poolside wait staff, butlers and room service ensure everyone is well-taken care of. 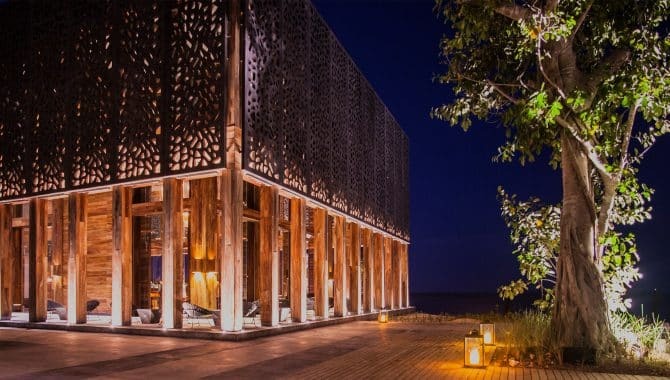 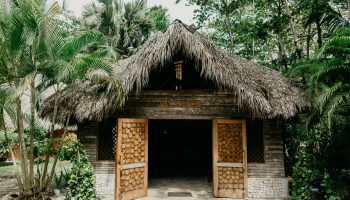 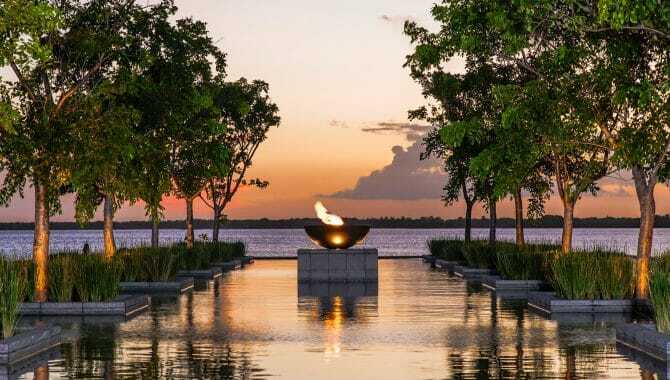 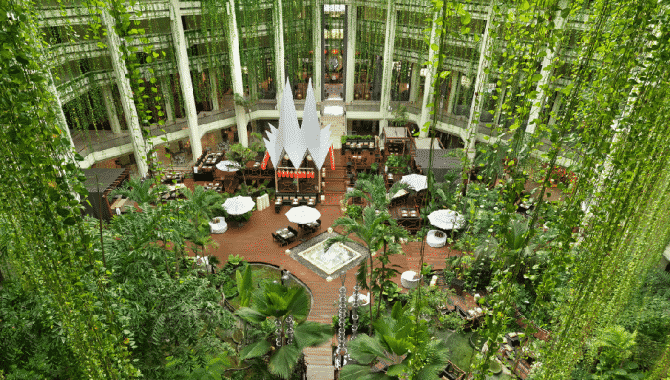 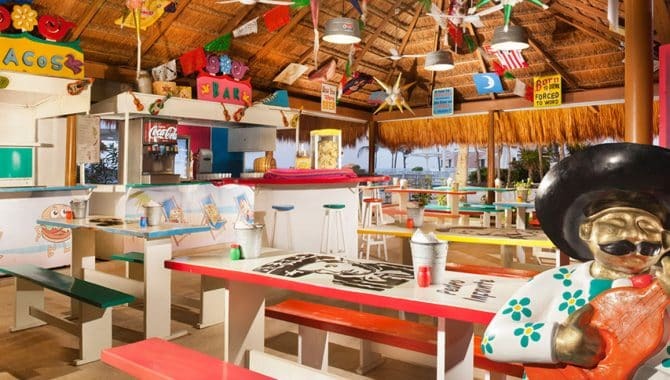 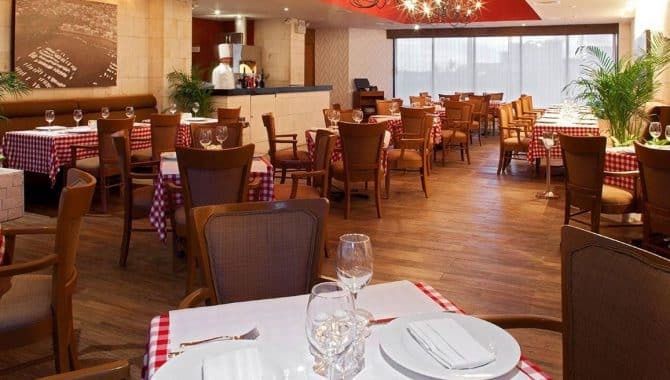 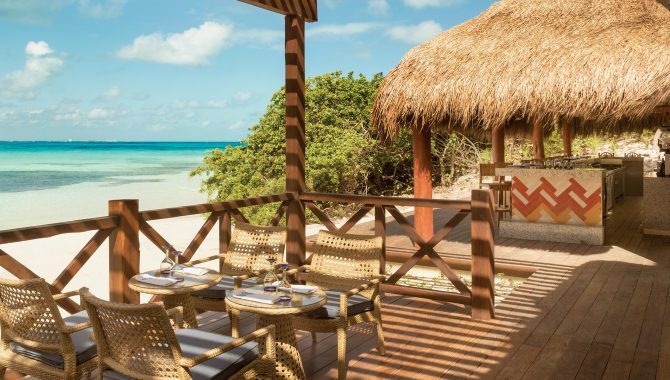 Choose a different style cuisine every night—this well-equipped resort has six international restaurants, a food cart, a snack bar and three bars. 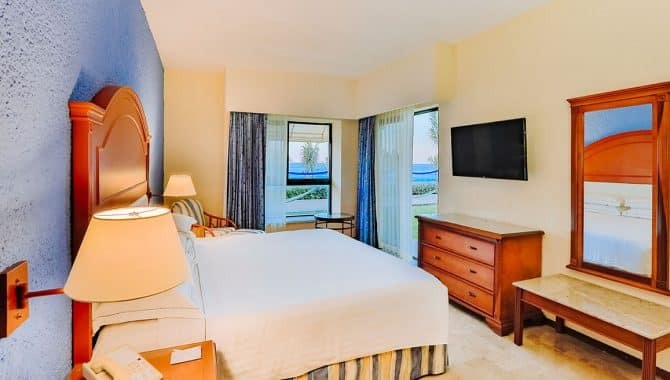 Suites accommodate up to five people and each room’s decor evokes tranquility and calm with soothing ocean tones and plush bedding. 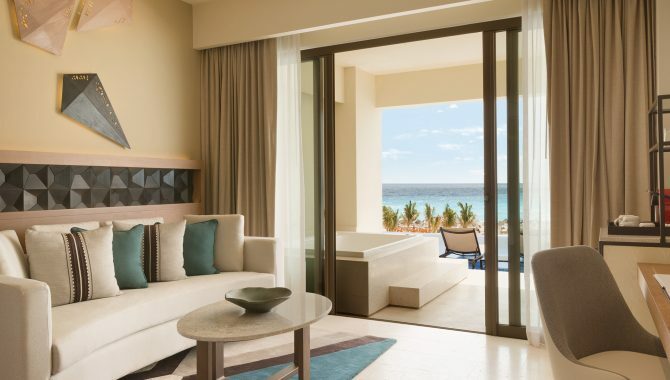 Private balconies furnished with hammocks, minibars and flat-screen TVs make the perfect set-up for relaxing out of the sun. 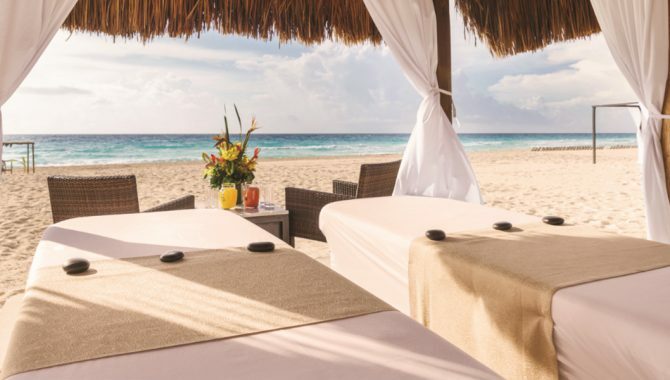 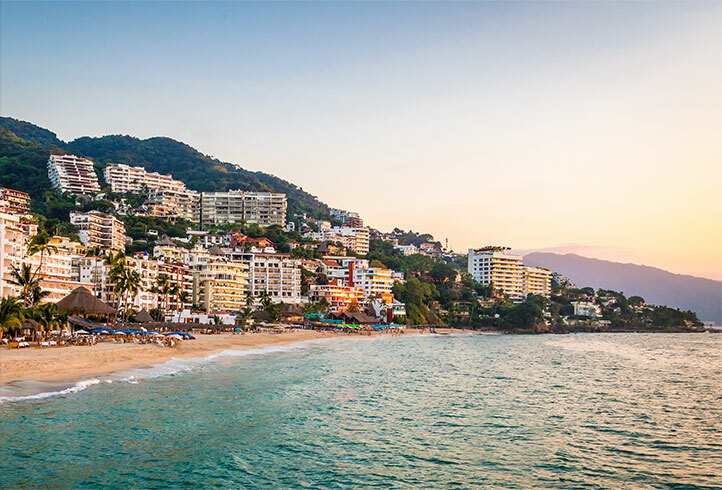 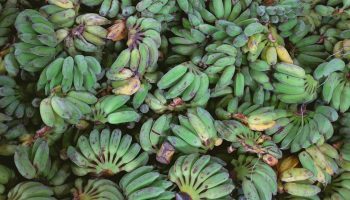 Take home new skills from the wine and tequila tastings or guacamole making classes or embrace vacation with Zumba on the beach, beach volleyball, soccer, kayaking and of course we can’t forget—the spa. 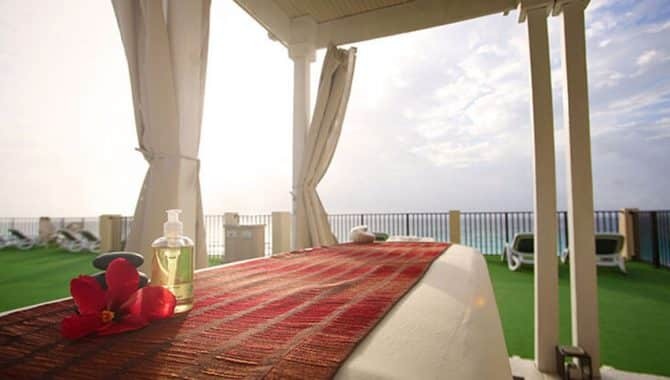 While the spa isn’t included with your all-inclusive package, a massage or facial is definitely worth splurging for. 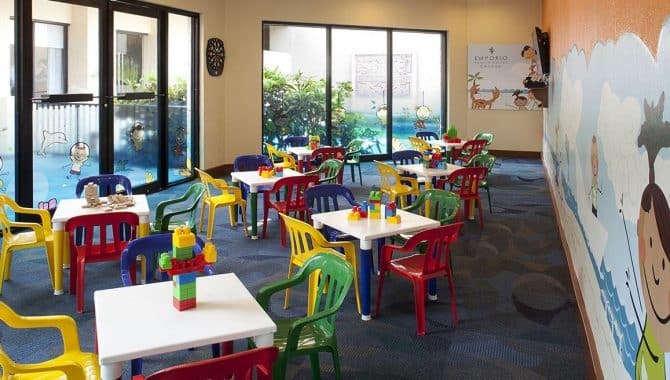 The Camp Jack kids’ club offers fun for the whole family with a waterpark, mini golf, movie nights by the pool or beach and entertainment like magic shows. 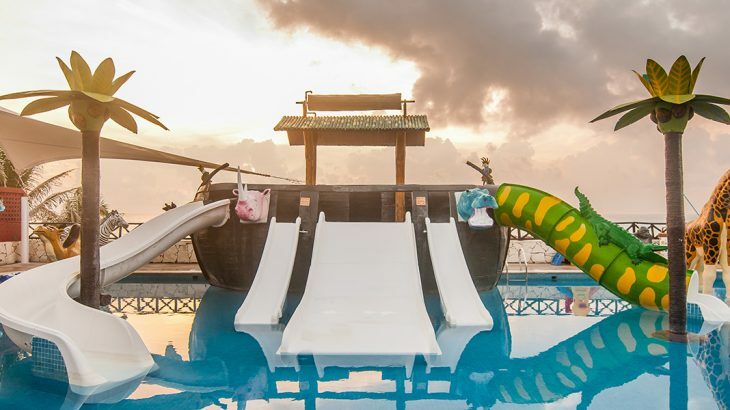 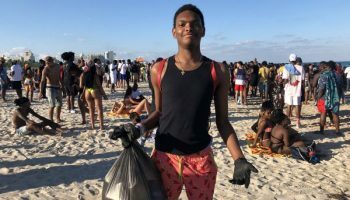 The resort’s #Hashtag program offers a hangout for teenagers ages 13-17. 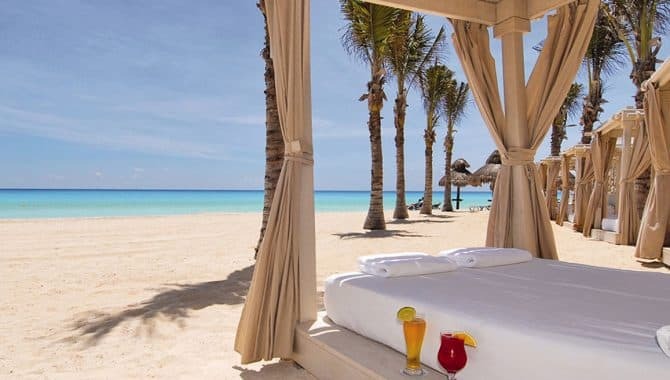 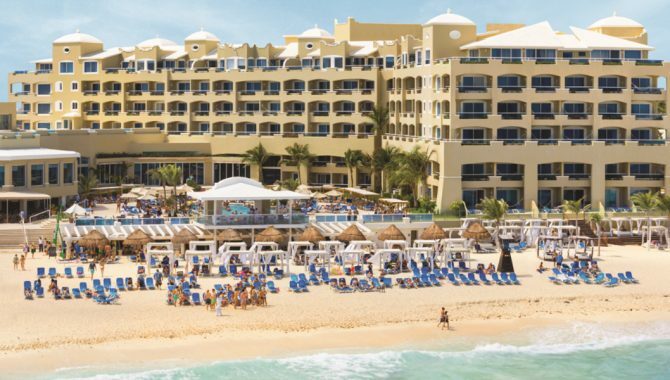 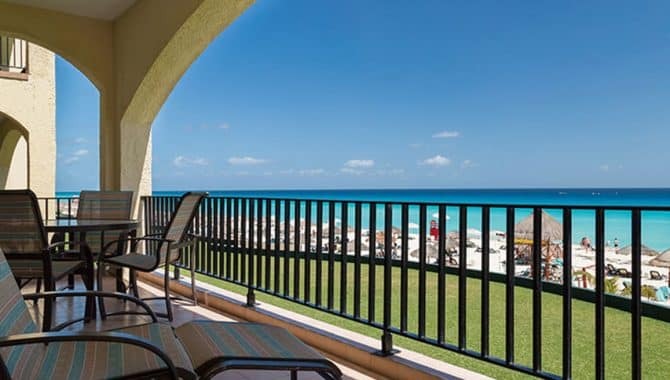 It’s panoramic beach views at the Grand Park Royal Cancún Caribe All-Inclusive Resort, where 311 guest rooms and 33 villas face the ocean. 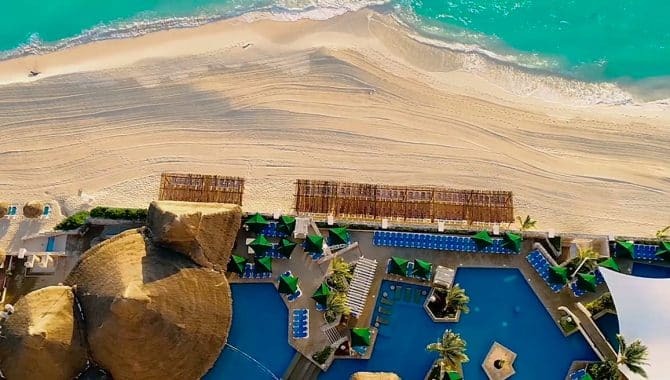 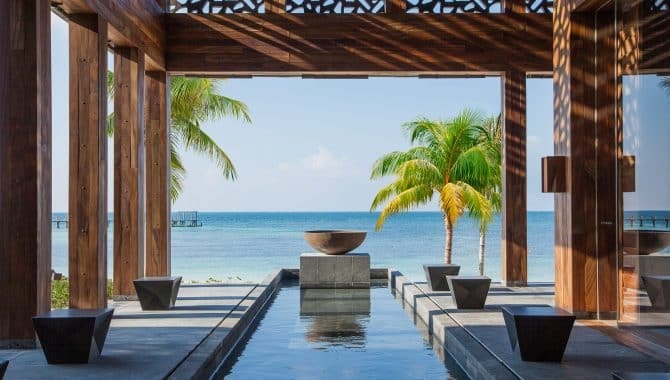 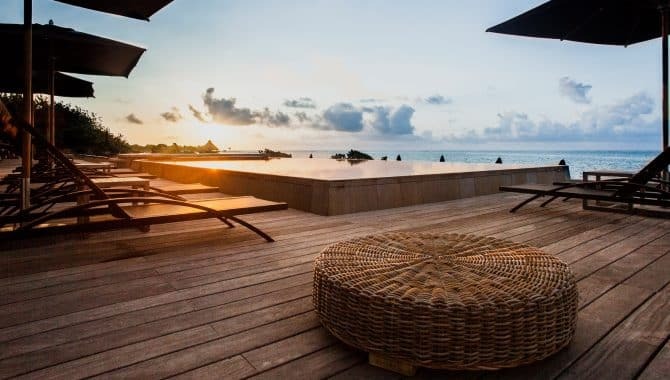 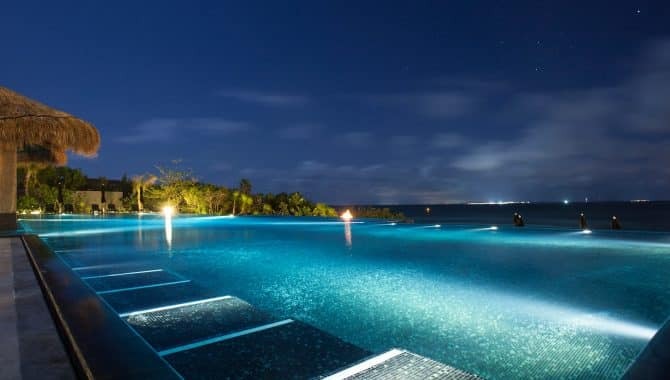 Newly renovated, this resort ups the ante for days in the sun with two swimming pools, a private beachfront and beach-side activities ranging from sailing to snorkeling. 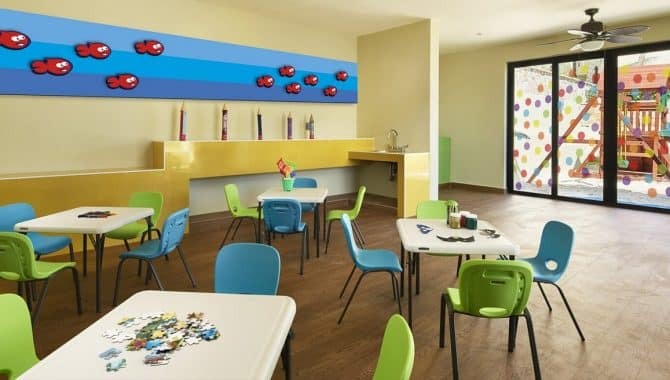 Kids are in paradise here too, with their very own beach and pool, as well as all day activities with games and super hero special guests. 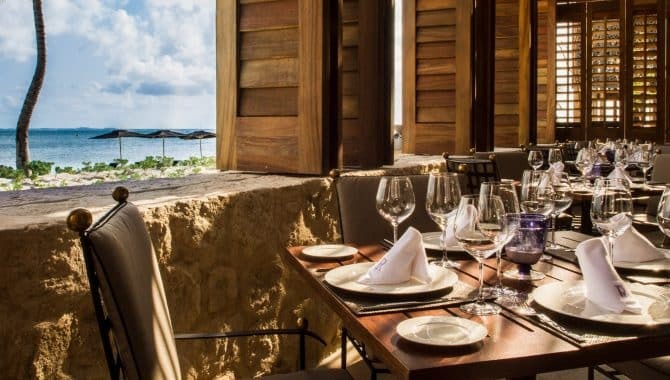 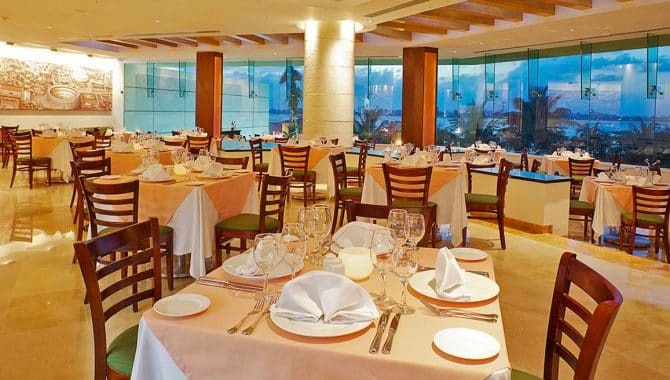 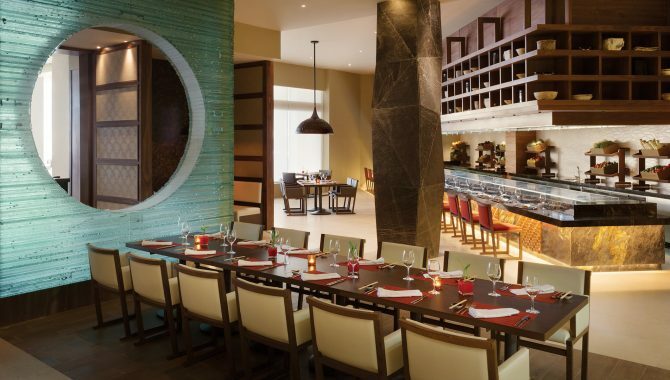 Four restaurants add to the all-inclusive experience with Cocay Restaurant providing an elegant, but casual all-day dining buffet, while La Concha, an all-glass dining room overlooking the resort’s pool and ocean views, serves up an a la carte menu in a chic setting. 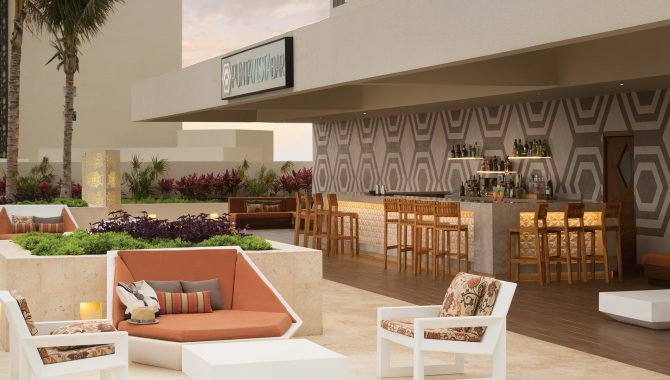 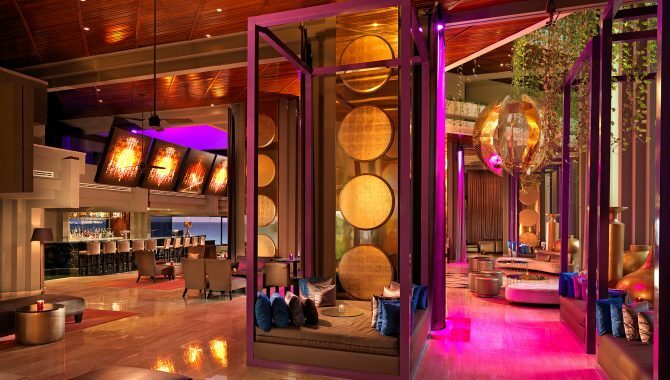 Adults may unwind at the Ekinox Lounge, a rooftop nightlife scene, or at Premier, a swim-up bar open all day long. 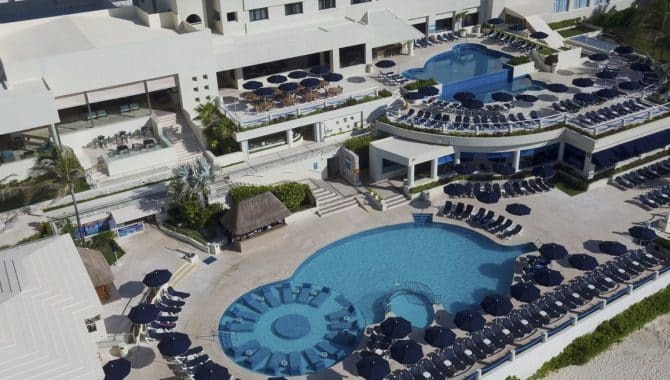 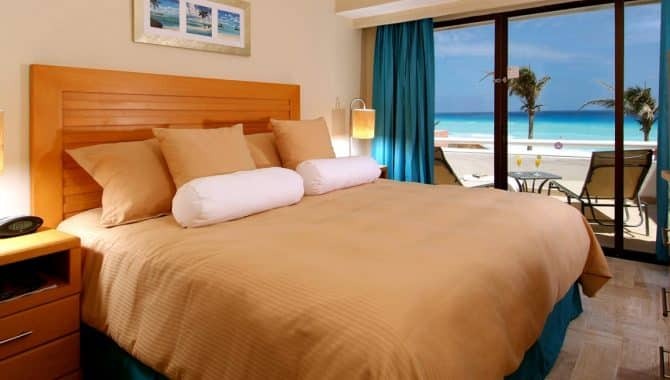 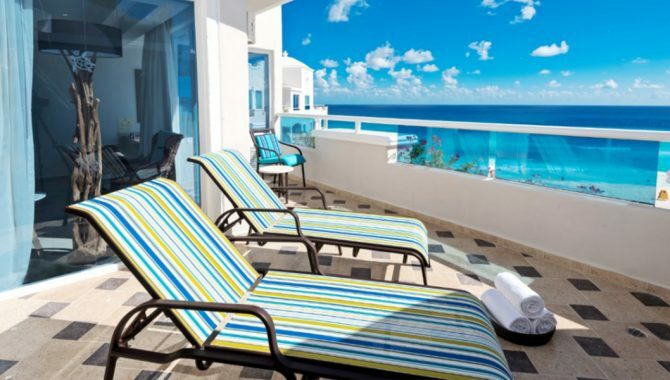 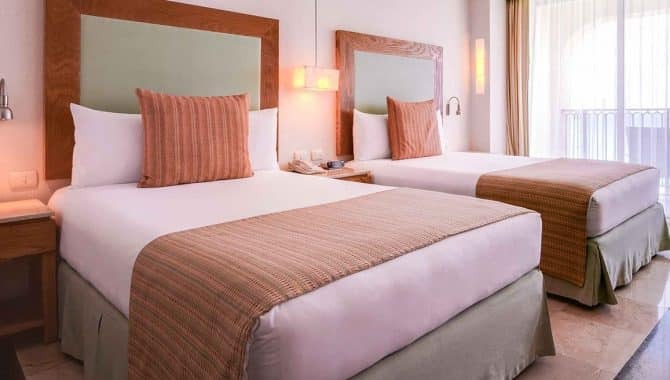 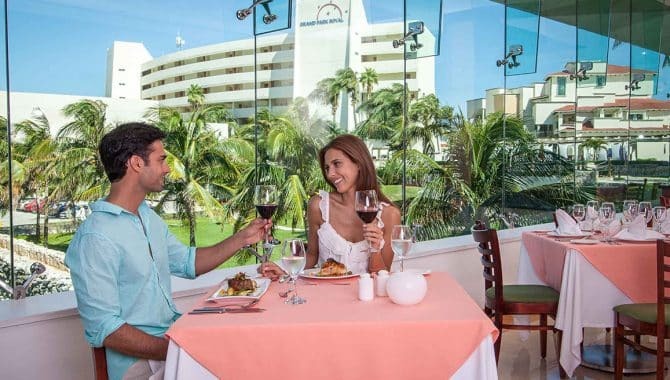 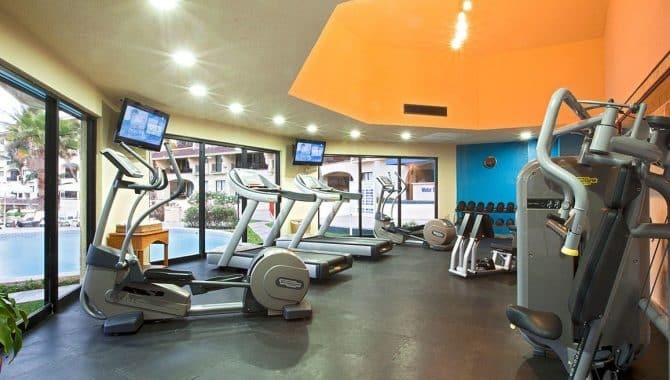 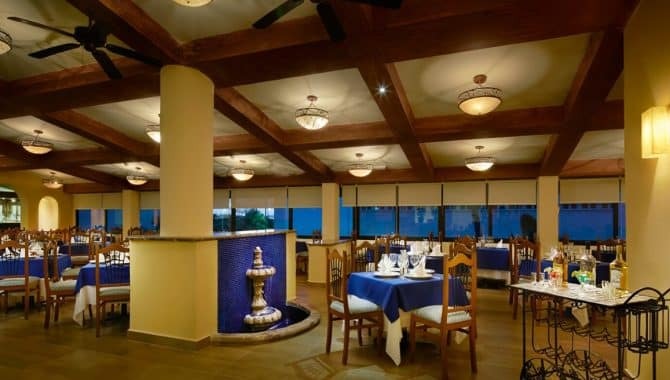 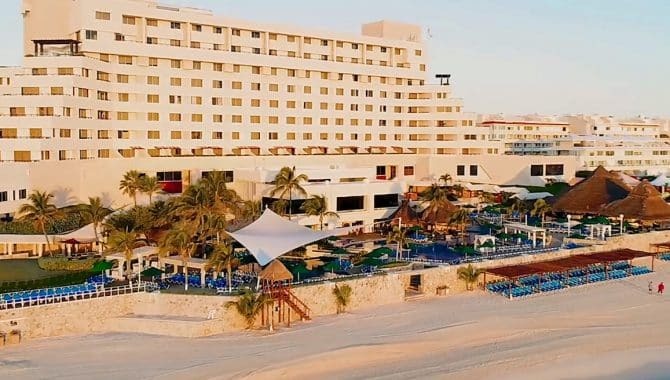 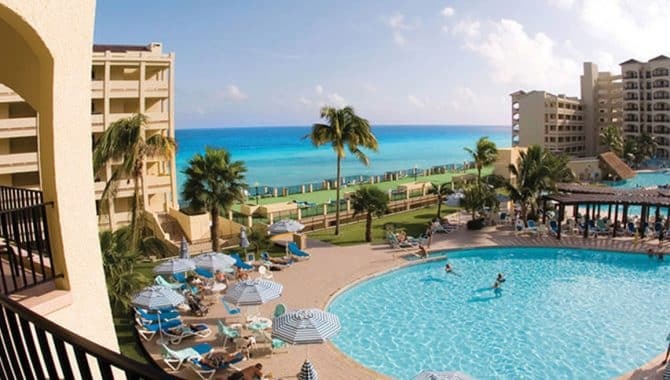 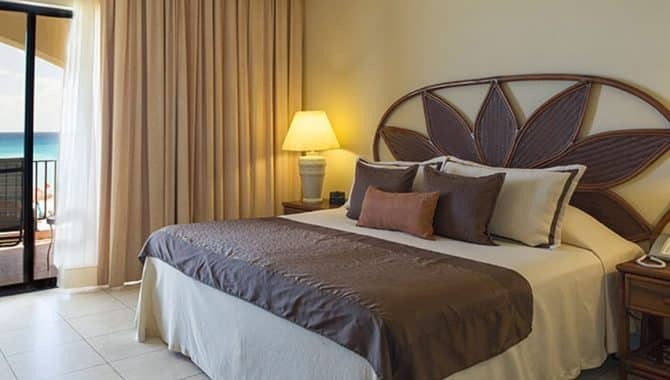 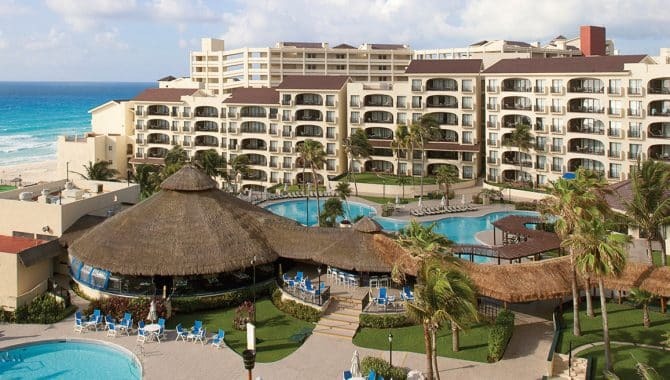 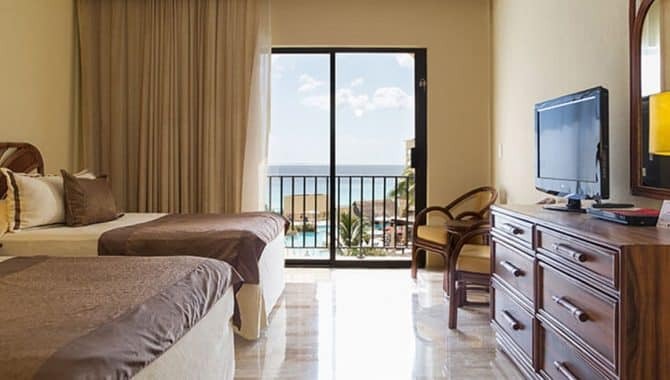 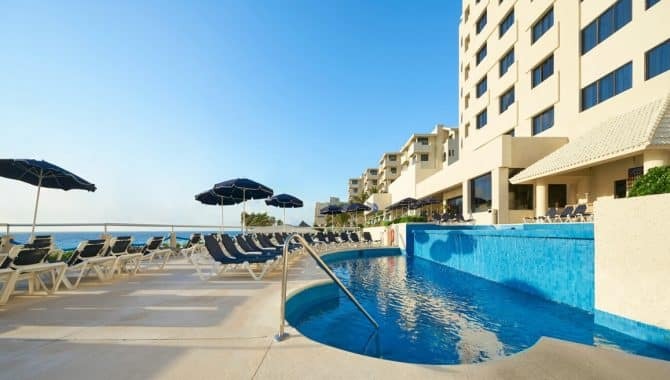 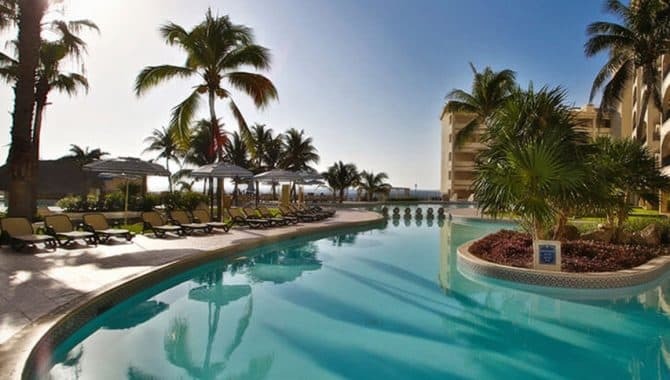 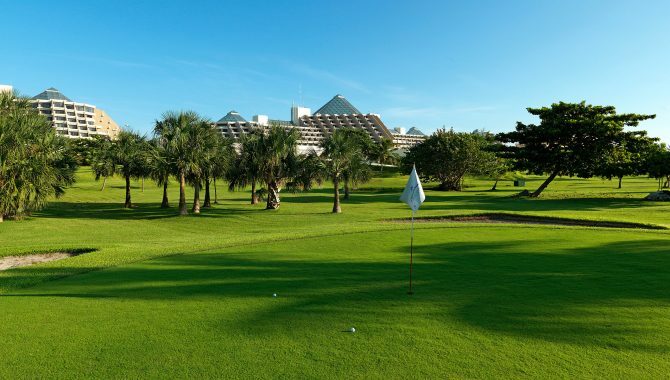 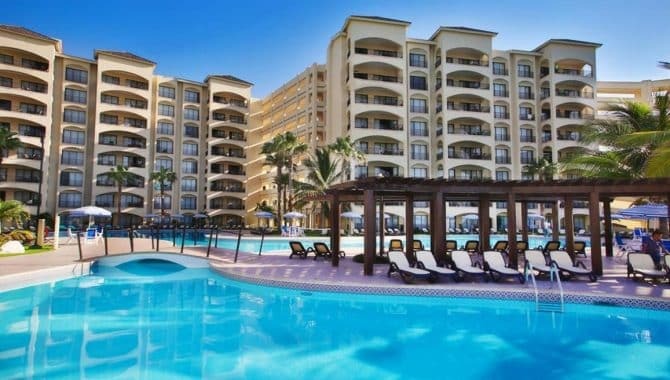 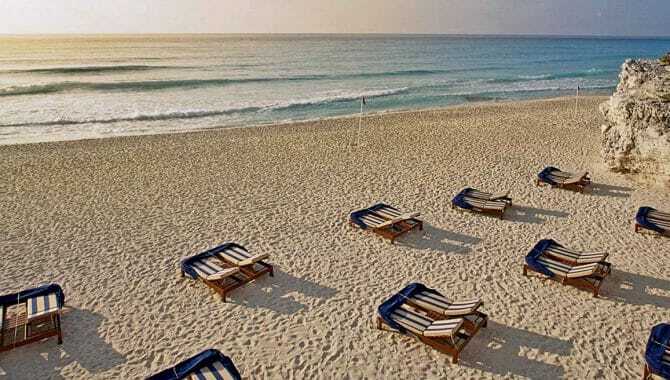 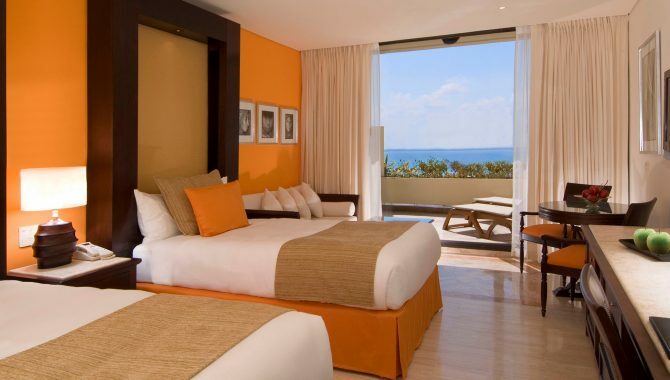 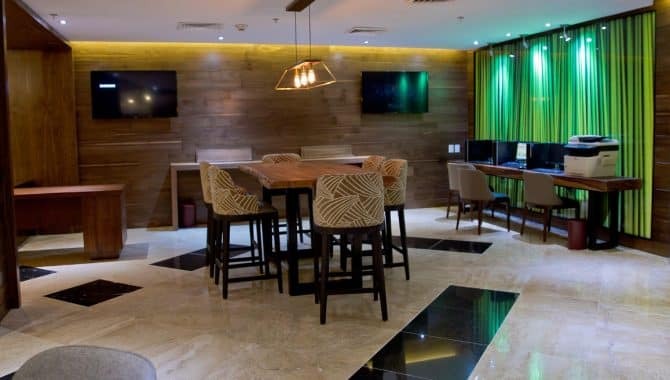 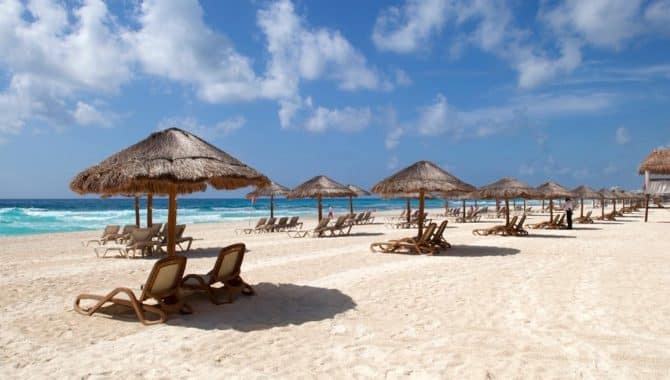 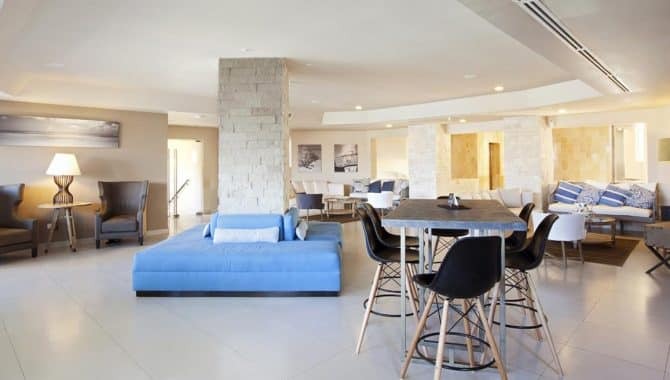 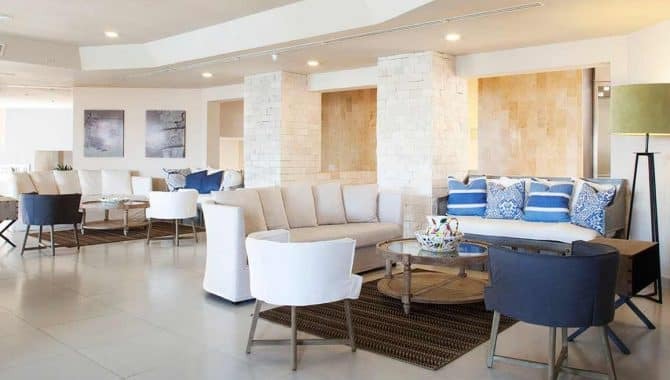 Set on a sprawling beach in Cancún’s Hotel Zone, Occidental TuCancún is an updated all-inclusive resort conveniently located near upscale shopping and attractions. 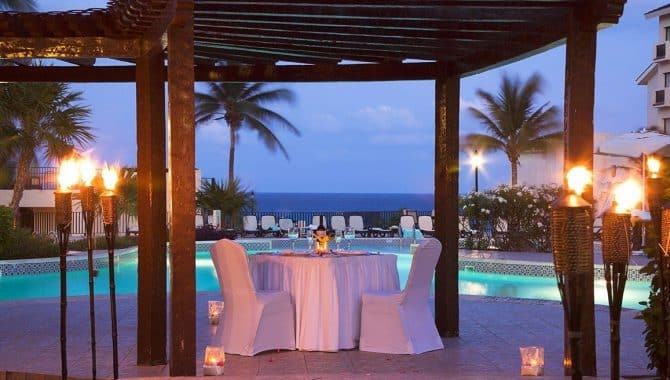 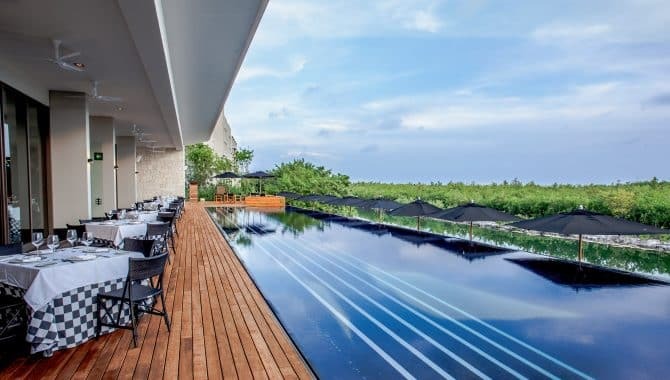 Enjoy the resort’s four restaurants, including both a la carte and buffet options, as well as three swimming pools overlooking the ocean, one dedicated to adults only. 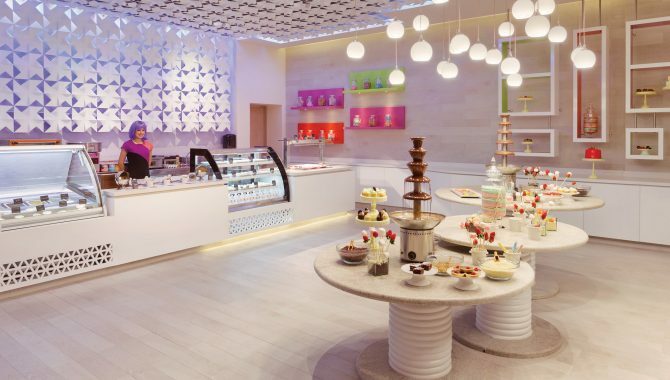 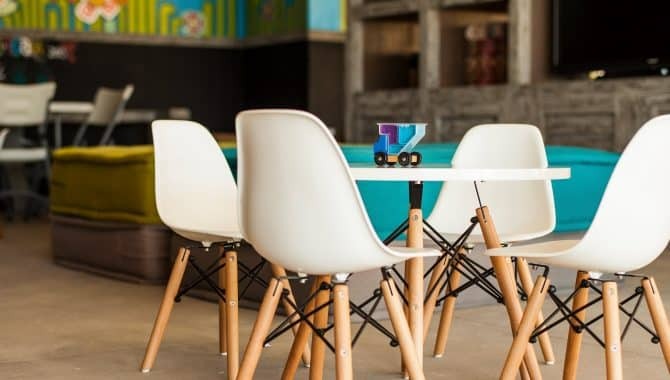 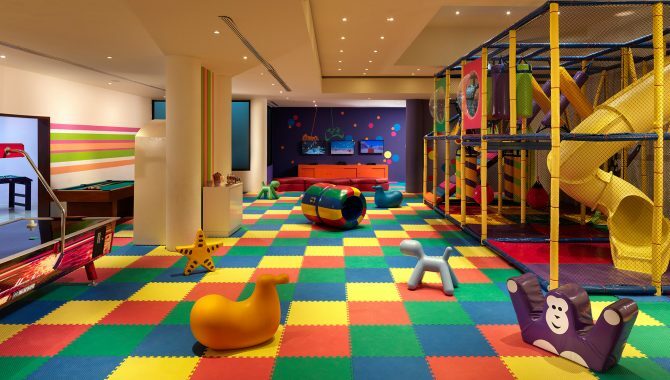 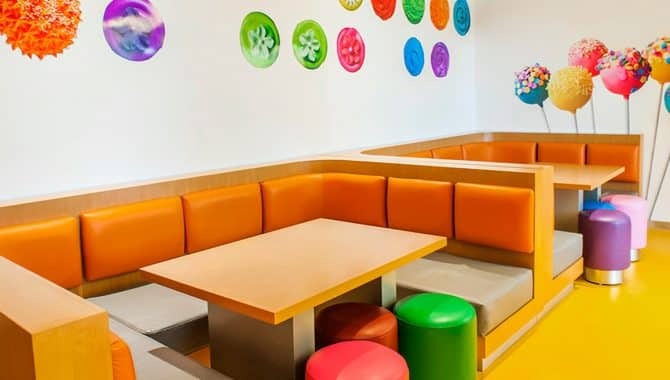 For the kids, there’s a kids’ club with outdoor play areas and an activities room. 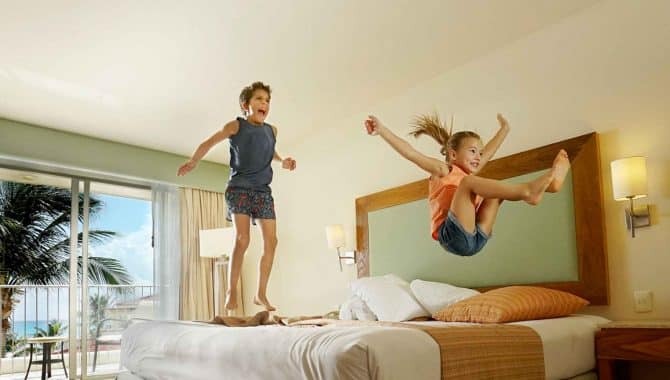 Check into one of the 336 rooms and suites, some offering split floorplans and kitchenettes for families. 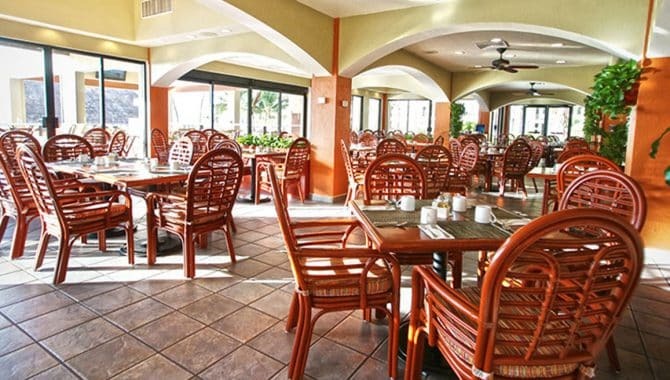 It should be noted that there is an extra fee for Wi-Fi. 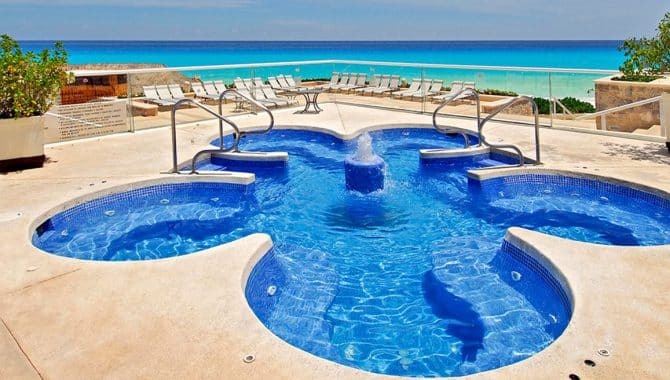 For a resort that already sits on the ocean, there sure is an extra emphasis on water here! 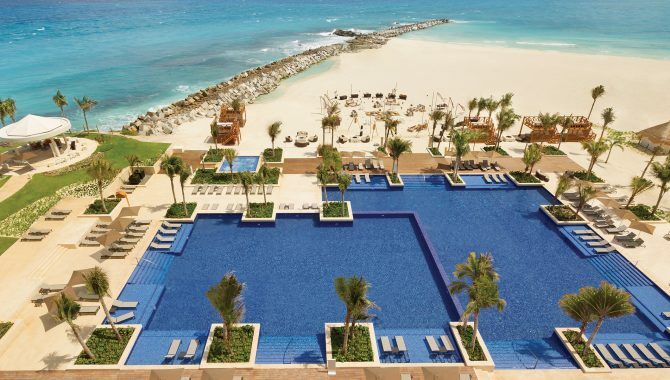 The multi-tiered pool complex offers swim-up bars and spouts its own waterfall. 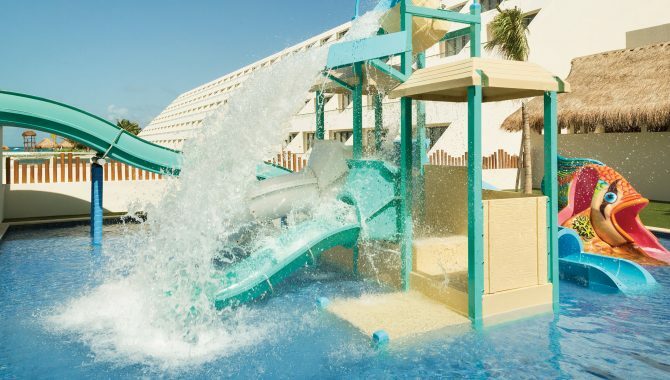 The kids’ water park is a Noah’s Ark-themed playground of waterslides and colorful animal statues where the young ones can swim alongside beautifully sculpted elephants, giraffes and rhinos. 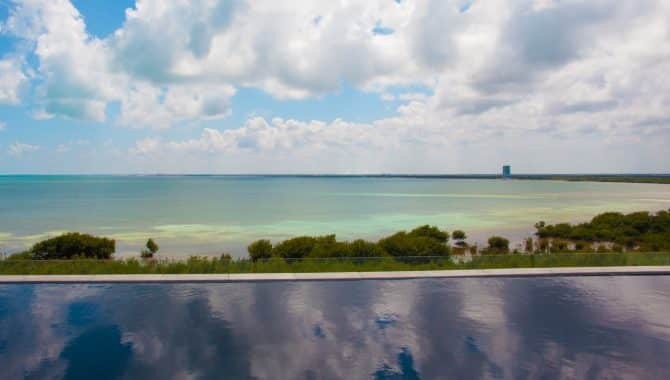 A private marina offers kayaks and windsurfing as part of the resort’s all-inclusive plan. 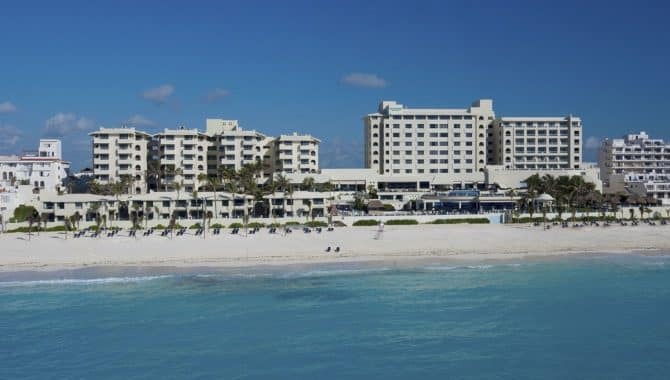 There’s also an option to rent motorized ocean vehicles. 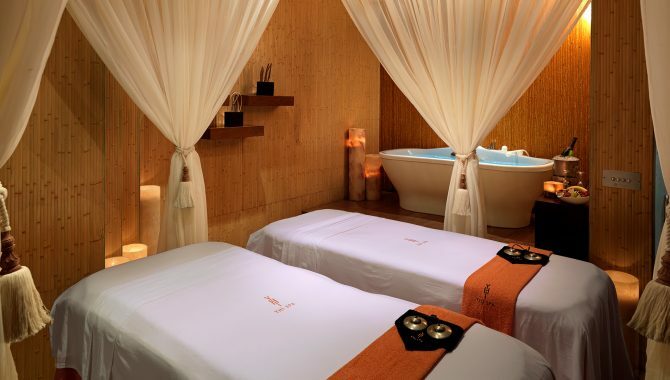 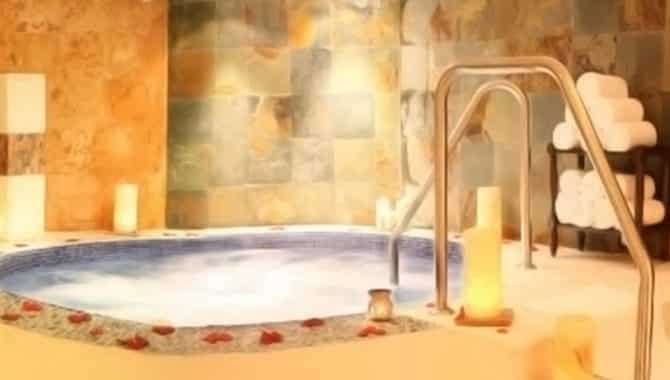 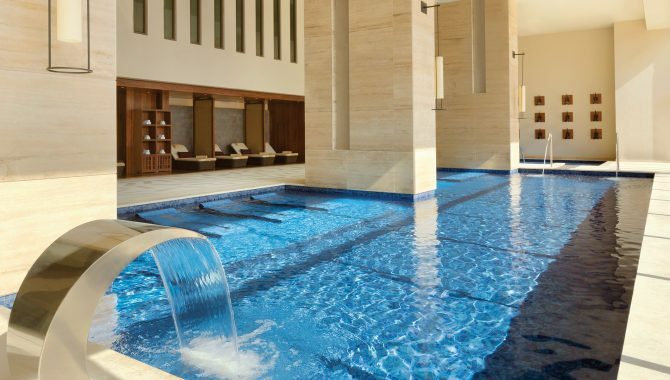 While the spa may be on the smaller side, it still offers all the customary amenities one should expect. 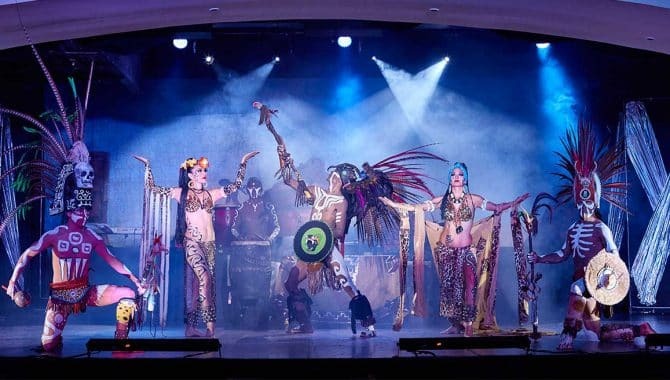 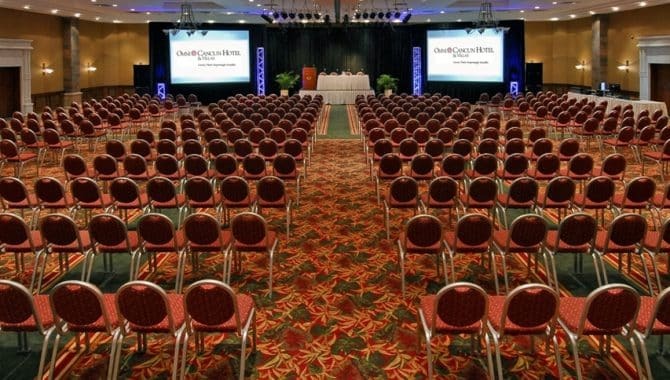 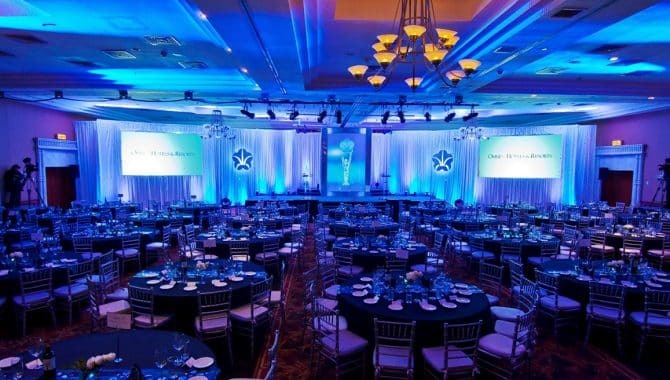 Live musical shows have performers reprising everything from Mexican favorites to Broadway classics for partying guests. 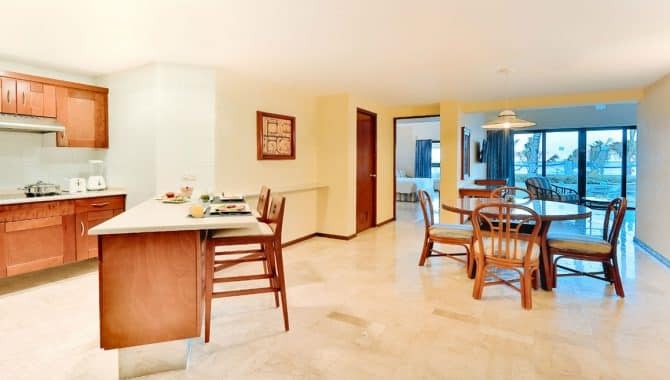 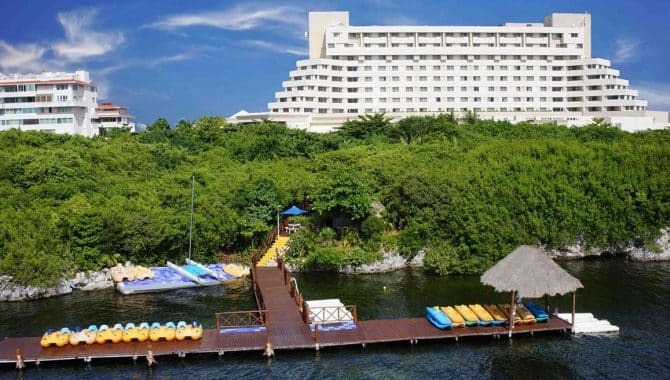 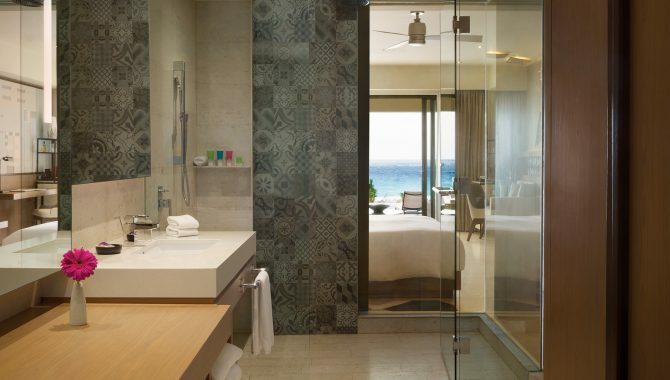 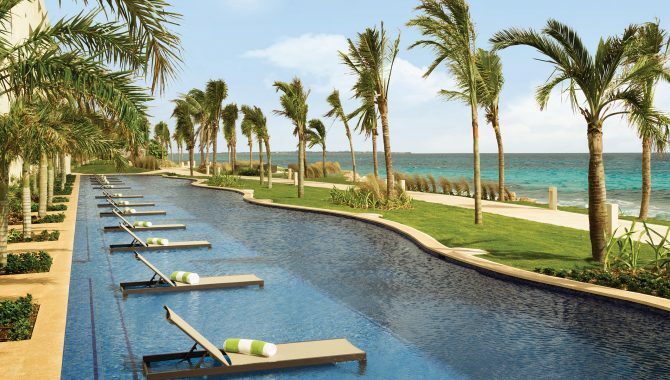 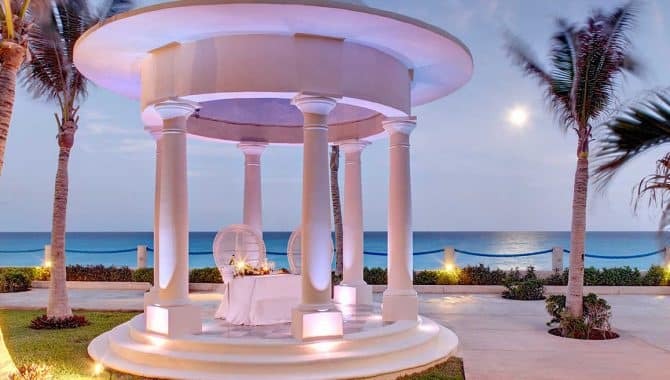 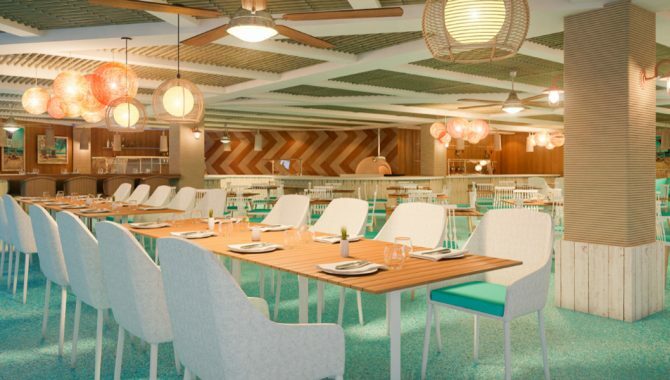 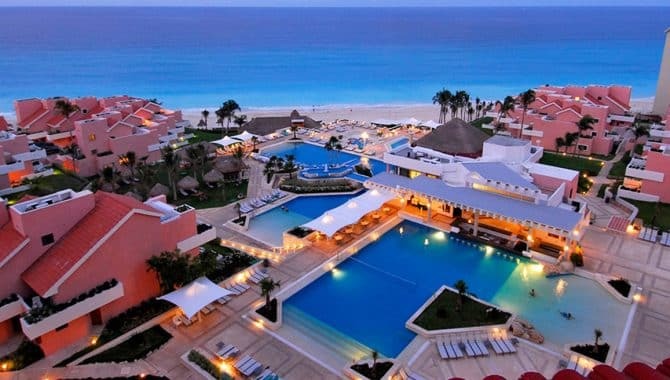 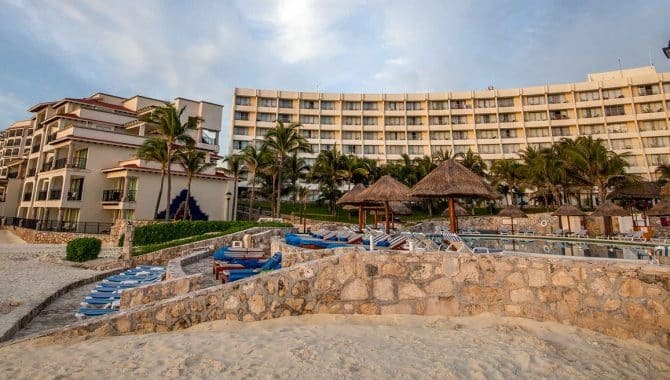 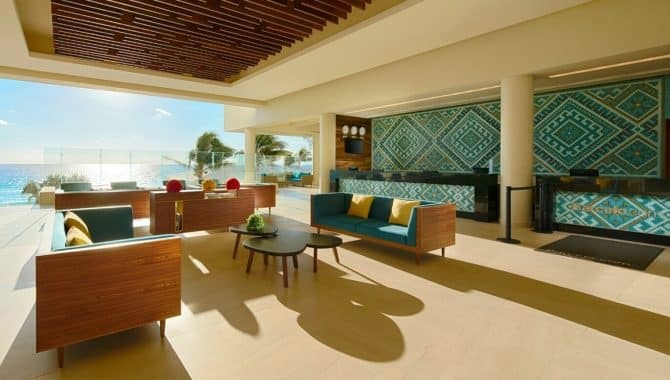 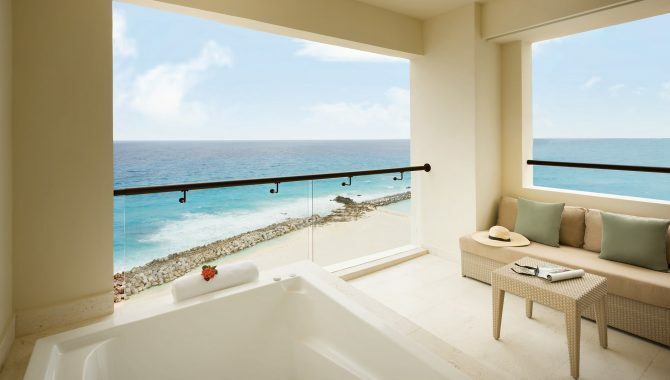 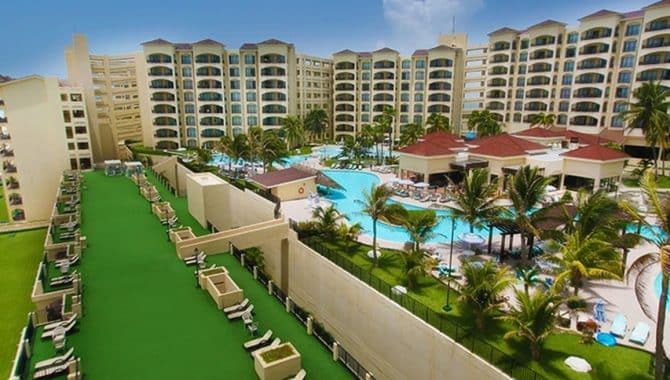 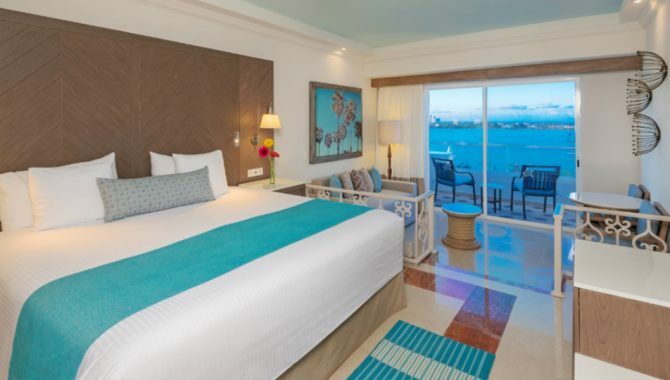 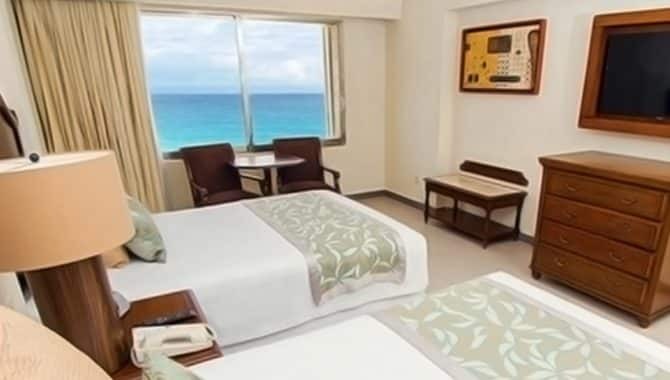 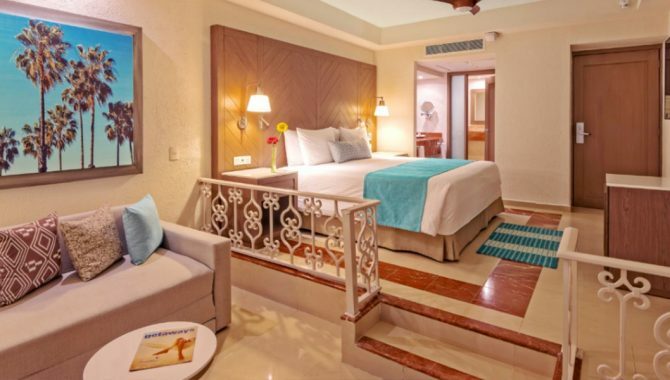 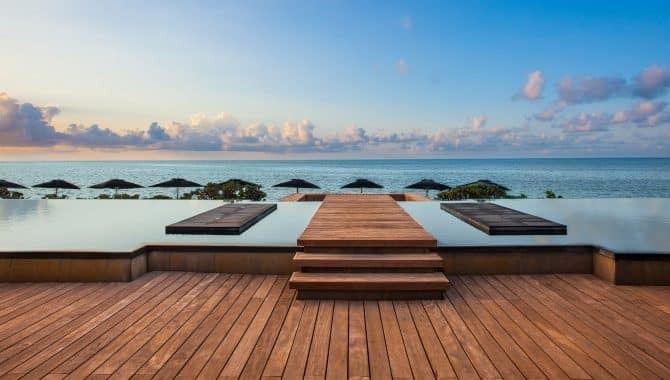 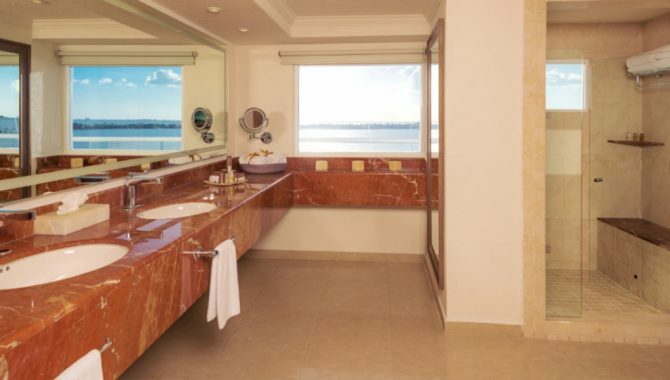 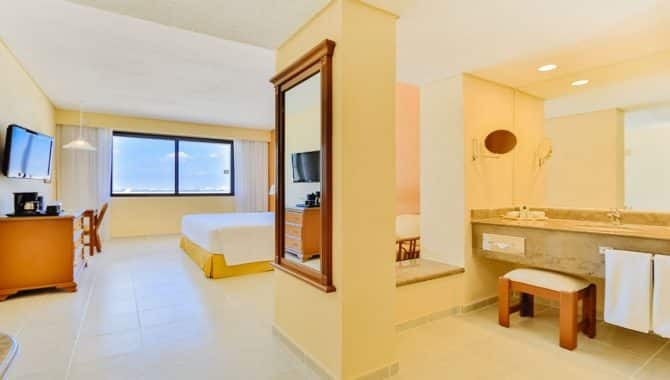 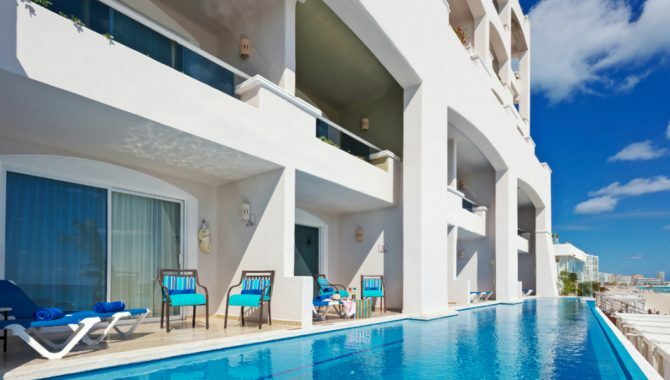 There are a variety of room options ranging from basic to deluxe at Royal Solaris Cancun, each one featuring a water-front view of either their lagoon or beach and some with outdoor hot tubs. 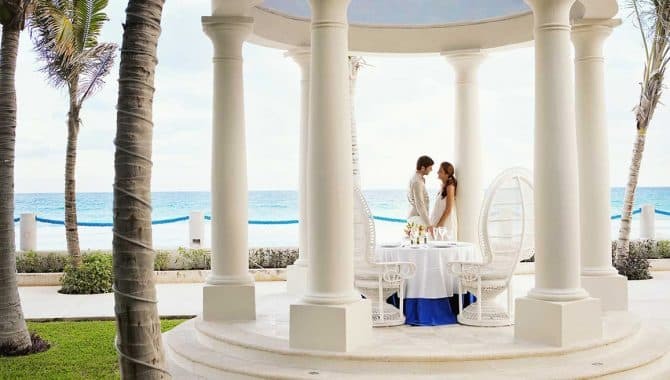 If you’re opting for a more intimate getaway, the perfect choice is a deluxe romance package that includes decor in the room, complimentary champagne and a candlelight dinner for two. 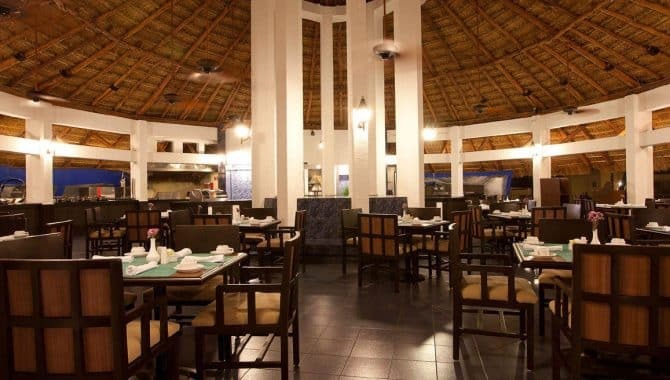 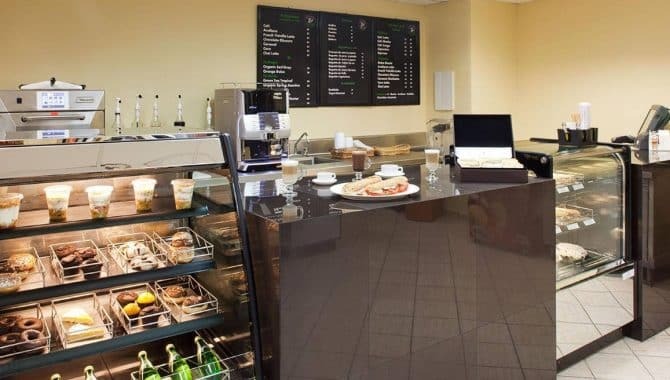 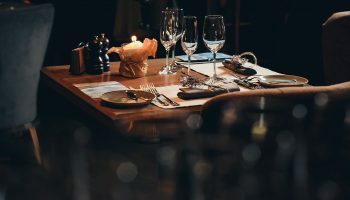 Six restaurants on the property have a great variety of fare including a sushi bar, a pizza kitchen and fine dining choices. 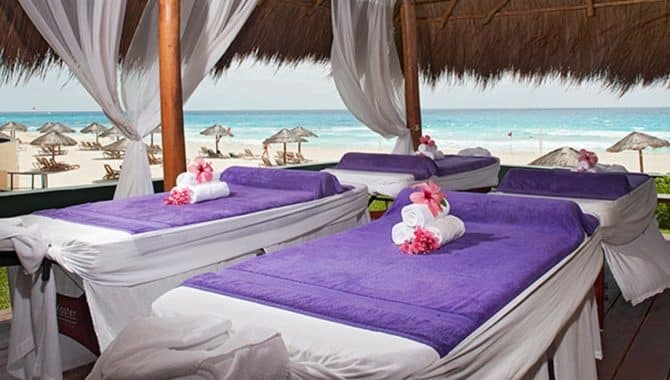 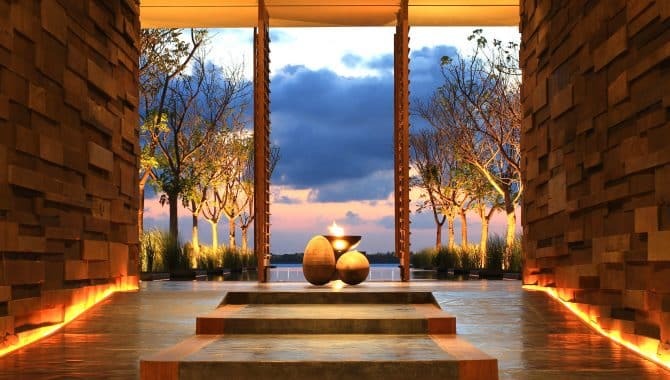 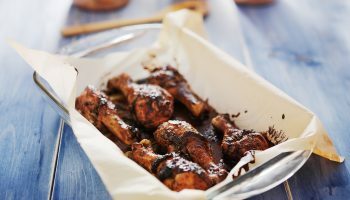 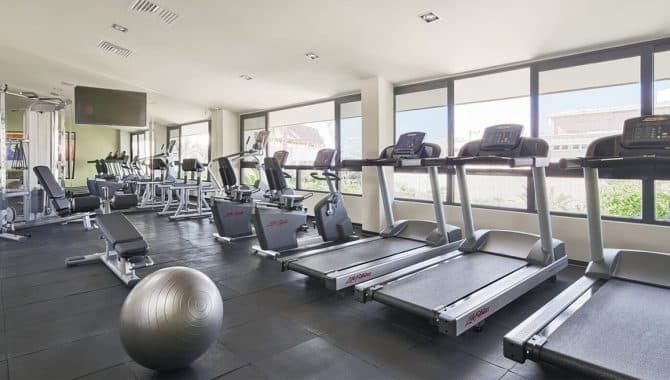 Yoga, fitness and cooking classes are also part of the all-inclusive deal.